This league season I have been playing with a JOOLA Fever blade. This is an offensive carbon blade and one of JOOLA’s best sellers over the past few years. It has a 5+2 ply build with the 2 ply build formed by lightweight carbon meliorate. But is it any good? How does it perform when topspinning, hitting, pushing, blocking and serving? And what type to player should consider using this blade? The JOOLA Fever blade is an offensive blade, but the speed is quite moderate. This makes it super-easy to control your shots. I have been using the JOOLA Fever blade with JOOLA Rhyzer 48 on my forehand and JOOLA Rhyzer 43 on my backhand. So even though the blade is only medium-fast, when combined with these fast rubbers, the overall set-up allows me to play with speed when needed, but also great control, particularly when blocking. It’s very easy to topspin with the JOOLA fever blade, particular when playing topspin to topspin from close or mid-range. This is the best blade I have used for quick counter topspins. When attacking backspin balls – pushes and chops – it’s a bit of a mixed bag. If I execute my loops with good technique, then the blade is decent. I can generate lots of spin, with good speed and high consistency. But if my technique is not quite right, I’ll often stick the ball in the net. I can’t rely on the blade to make up for poor technique! This is not necessarily a bad thing, as it has forced me to really engage my legs and core properly when looping. The JOOLA Fever blade is surprising good when hitting the ball – either smashes, drives or topspin-drives. You can put a lot of power into your hits and still get the ball on the table with high consistency. You can really feel the ball when hitting. The vibration from the blade seems pretty low and because of the carbon layer, there is quite a large sweet spot. So even if you don’t get the perfect contact, the ball still seems to go on. Pushing is decent. It’s pretty easy to keep pushes low and control the length. The blade is just very reliable! I have found it very effective at doing deep, fast pushes. You can really load up the backspin. Touching short is also good. The JOOLA Fever blade is wonderful to block with! So easy! I can really absorb a lot of heavy topspin and send the ball back low over the net. I have also found it very useful at changing the speed of my blocks. So I can easily take the pace out of the ball and slow the rally down or add some speed into the rally with quick blocks. The blade is great at doing both. Service is a bit mixed. I have found it a bit harder to serve short with heavy spin. Too often my balls are drifting long or lacking spin. This is a work in progress! However, long serves are great. Topspin, backspin, side-backspin, side-topspin all work great. I can generate lots of spin and speed. I have a flared handle with my JOOLA Fever blade. At first I found the handle a bit rougher than my previous Timo Boll Spirit blade, but actually this seems to help me grip the handle better. The handle is also a little thicker than the Timo Boll Spirit blade, which has also been a benefit for me. It has stopped me over-gripping and seems to have resolved some wrist pain I was getting. Bonus! The blade edges are quite smooth, so it’s very comfortable to play with when switching between forehand and backhand strokes. Who is this blade for? 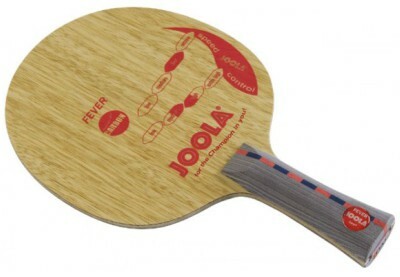 The JOOLA Fever blade is ideal for a player who likes to play close to the table or mid-range and has an all-round offensive game, mixing up topspins, drives and blocks. If you value high consistency over blistering speed, then this could be a great choice for you. I really like the JOOLA Fever blade. I have had my best ever season using this blade and will sticking with it for the foreseeable future. I highly recommend! If you’re in the UK, you can buy a JOOLA Fever blade from Bribar Table Tennis. If you’re in the USA, you can buy a JOOLA Fever blade from Megaspin. For the rest of the world, I recommend looking at the JOOLA website, which has links to suppliers all over the world. Click on the ‘Agency Worldwide’ tab.